Body Type: Medium length body with well rounded hindquarters. Base of each hair is slate blue. intermediate band id pearl, top band is black. Ears are long and upright. Weight: 8 1/2 to 11 pounds. 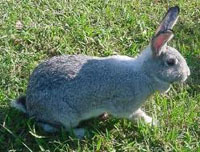 Body Type: Cinnamon-colored rabit with gray ticking across the back. Body is medium length, well rounded; ears are large and erect. Weight: 8 - 11 pounds. 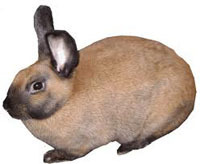 Body Type: Orange-silver-colored rabbit. Medium-length rounded body. Ears medium long and upright. Body Type: Hinderquarters are rounded, shoulder and head narrow. The ears are lopped and extremely large, often measuring 24 inches from tip to tip. Special Care: This rabbit requires extra care because of the ears. which are susceptible to disease and injury. Weight: 10 - 14 pounds. 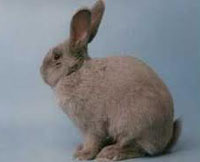 Body Type: The largest of the lop breeds. 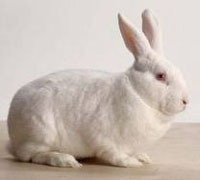 This rabbit has massive, well muscled body with a wide head and thick, wide, lopped ears. 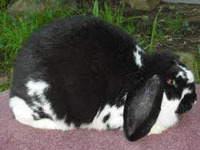 The French Lop has been bred in many different colors. 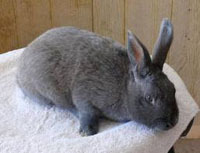 Special Care: Favorite companion rabbit of many because of its laid back and affectionate personality.